Adult members of UCSI make a habit of learning more every day! That is why we hold seminars, share in services, have book discussions and summer forums. Especially precious are the life stories and wisdom of our seniors. Their insights and experiences enrich the spiritual life of our whole community. The UCSI encourages adults to explore their beliefs and participate in periodic Adult Religious Exploration opportunities. Regardless of your religious education background or present beliefs, we strive to create an atmosphere that respects and values individual differences, while presenting the ways that the Unitarian Seven Principles and the Six Sources can enrich daily life. Together, we learn to grow, by sharing a rich variety of religious, ethical and cultural experiences. The goal of adult religious education is to encourage membership in our church. The Path to Membership class is an excellent way to learn more about Unitarian Universalism, our church and its members. As we get to know each other, explore our spiritual journeys and what moves you about the Unitarian Church of Staten Island, you can gain a deeper understanding of Unitarian Universalist theology, increase your knowledge of American Unitarian and Universalist history, take a tour of the building, learn more about our committee structure, and what membership in the Unitarian Universalist Church of Staten Island could meet to you. Please check with our Calendar and Events/Services for the next scheduled Path to Membership Group meeting. The UCSI Membership Committee members are available to answer your questions at any time! Email us!. Small group ministry provides an opportunity for new members of the church to bond with longtime members. Small groups carry forward the history of the church, and present opportunities for its members to give back to the church and their community through small actions that may range from developing a fair trade purchasing program, to building and installing an outdoor free library for the local community to enjoy. Sometimes referred to as "covenant groups” and “chalice circles,” Small Group Ministry is a vital part of our UCSI congregation. Groups of 10-12 people meet regularly—usually monthly—to reflect on and discuss significant life topics. Small groups are great places to get to know other people in the congregation, and to learn the history of our church. Participants often learn new things about themselves. Over time, participants build deep connections with one another, with the congregation and with the sacred. Whether the topic is “good and evil,” “mindful living” or “letting go,” the conversation is respectful and caring, and leads to greater understanding and cohesiveness. Each session is facilitated by a member of the congregation, and all participants have an opportunity to share their views, tell their life stories, and listen deeply. The time together is structured. Groups begin and end with centering readings and often include a time of silence before the sharing begins. Many small groups engage in annual service projects, putting their faith into action. Please check our Calendar and Events/Services for the next Small Group Ministry opportunity. There are many opportunities for adults in our community to learn more about themselves and the Unitarian Universalist tradition, through our Summer Forums, book discussions, and field trips. Please check with our Calendar and Events/Services for opportunities to engage with our membership, challenge your intellect, and expand your spiritual and ethical horizons. 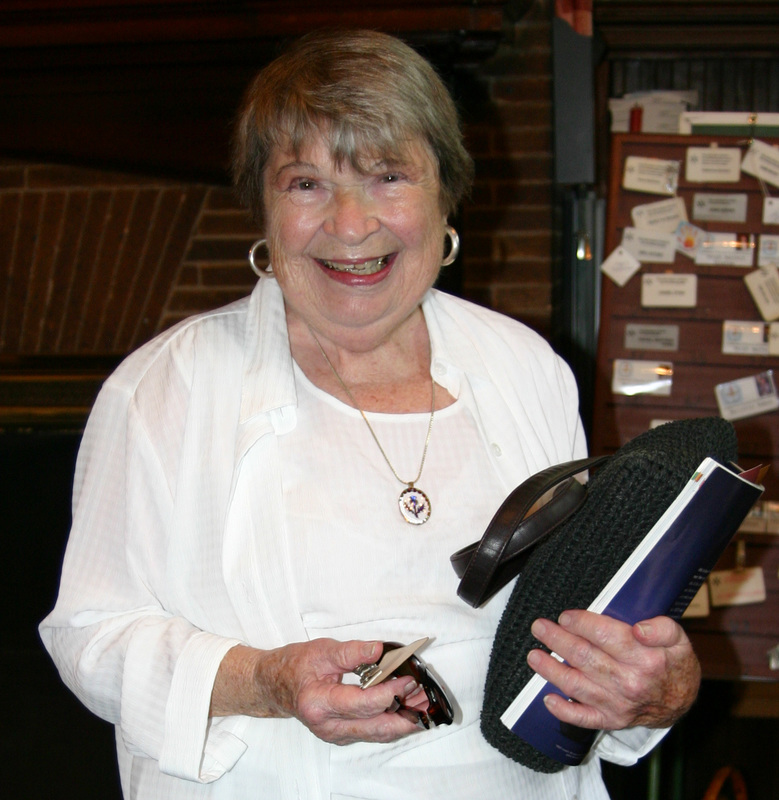 Church elder Virginia Allen shares her life story and memorabilia. The term "odyssey" refers to a long and eventful journey, from Homer’s Greek epic poem describing the journey of Odysseus after the fall of Troy. Our Odyssey program honors the elders in our congregation and stimulates dialogue among and between generations. We invite our elders to tell stories about their lives and the congregation. 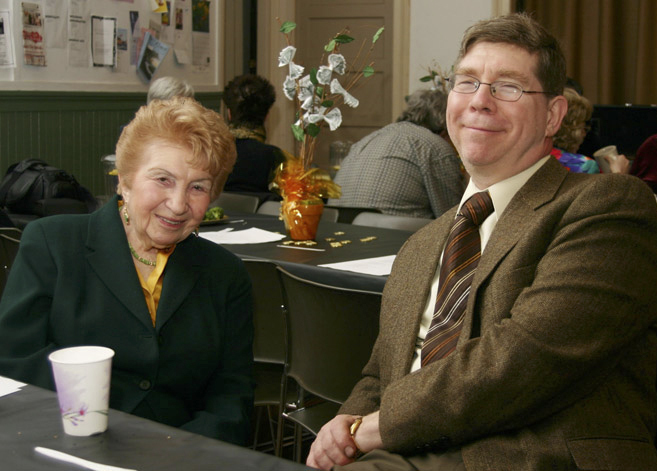 The Odyssey Program began on February 18, 2007, with the Odyssey of Del Eberhardt, the eldest member of our congregation. Since then, many of our elders have been honored, and have honored us with their stories. Long-time church member, Ruth Leason, with son Randy. 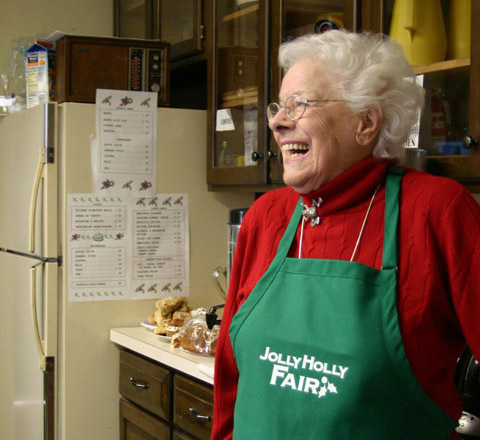 Beloved long time UCSI member, MaryLou Greene, in her Holly Jolly apron, passed away in 2013.